Customer service excellence is a continuous, ongoing process. 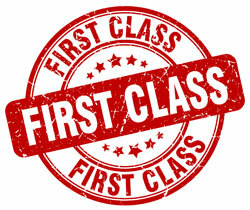 Here are some key ways to deliver first class service. Is first class customer service a target you suddenly arrive at after years of experience, practice and research? Or, is it a commitment your business maintains consistently to create the experience it wants? First class customer service is continuous. Constant. Persistent. Ongoing. Just like any commitment, you don’t maintain it for a temporary period of time—you dedicate yourself and your efforts to it, endlessly. It takes leadership engagement to achieve employee engagement which gives excellent customer engagement. A lot of companies promise their customers a lot of thing—the vow, the promise, the wedding so to say—companies entice their customers with all sorts of sweet nothings to lure them in the doors—but then what? Any company that’s good with words and charm can convince customers to give them a shot, but only companies that truly deliver will really win the hearts of those they aim to please. True loyalty breeds true loyalty. If you’re a leader, remember this: what you want your customers to give you, you must first offer them. You want them to be ceaselessly committed to your organization? Well, ensure your organization is ceaselessly devoted to them. It’s straightforward. Simple. And shouldn’t really be all that much of a secret. So, how do you do that? Don’t assume that with time it’ll happen—instead, be intentional. Schedule a weekly or bi-weekly meeting with essential teams, so that your constant commitment to delivering great customer experiences is continually communicated, reiterated and expressed. Work with your teams to do this. Too many leaders talk about being the best in customer service. Few do anything else. You have to lead the way, and walk the talk. Don’t assume you’ll know when it’s different—rather, take steps to measure the steps your organization has taken. Without tangible tracking in place, it’ll be hard for you to know when your employees are doing things differently, when your customers are experiencing things differently, and what it is that’s influencing your bottom-line. Regardless of what happens, you want to be able to understand why it happened. Next, you have to use the data. Far too many companies save the information in the file folder until next month. Then, most importantly, engage your team with communication, training, coaching, recognition and positive problem-solving. Intentionally making time and diligently recording progress are the first two ways to demonstrate your continual commitment to delivering great customer service—but the third (and critical) way will put real weight behind your words. You must regularly revisit your original commitments—not only to reiterate their importance, but to update them appropriately, adjust strategies prudently, and celebrate progress excitedly! Your team will respond by engaging the customer proactively and positively. Rick Conlow is CEO & Senior Partner of WCW Partners, a performance improvement company. Based in Minneapolis/ST. Paul, Minnesota, WCW work with clients in a variety of industries worldwide to help them excel in sales, service and leadership, facilitating business growth and vitality. Rick is author of Excellence in Management, Excellence in Supervision and Returning to Learning.